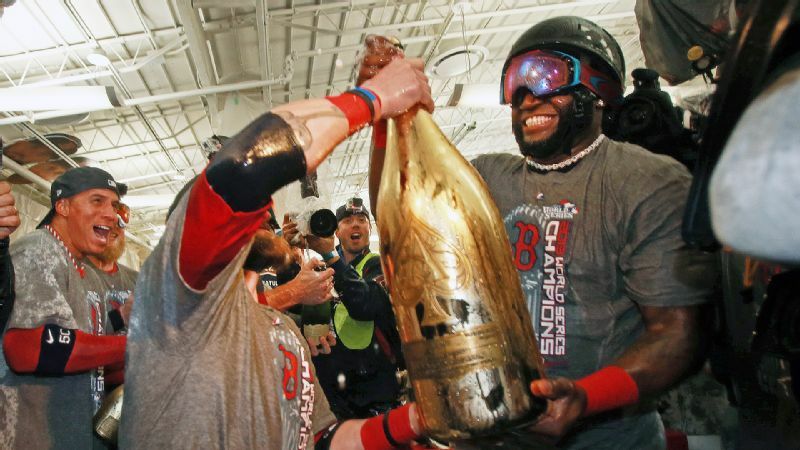 The Red Sox hadn't won the World Series at home since 1918, and David Ortiz's bottle had room for 95 years' worth of champagne. Skipped sports last night to ... wait, you skipped sports last night during Game 6 of the World Series? Yikes. This really might not be the column for you. Nonetheless, we've got you covered. Here's everything you missed last night. The Boston Red Sox won their third World Series in a decade on Wednesday night in a 6-1 Game 6 rout against the St. Louis Cardinals, likely prompting the ire of bitter Yankees and Cubs fans everywhere. As just about everyone everywhere knows by now, it was the team's first World Series-clinching game at Fenway since 1918. So naturally, players and fans alike all happily adopted the "party like its 1918" mantra. Despite the fact that 1918 is not particularly known as a momentous year in partying history, we're just going to pretend it was to justify the debauchery that went on in Boston. Here's what partying during the World War I era looks like in Series MVP David Ortiz's mind. Perhaps this is why Prohibition went into effect shortly after. Sadly, there is no video or pictures from the inevitable shaving station that we can all hope was set up right next to the champagne-guzzling section. The celebratory parade is scheduled for Saturday. Expect the, ahem, 1918-style partying to continue straight through its conclusion. Is taunting LeBron really a good idea? A day after their impressive season-opening win against the Chicago Bulls, the Miami Heat lost to ... the Philadelphia 76ers. This is not a joke, people. The team that LeBron James plays for lost to the team that was projected to win just 16 games this season. IS IT TIME TO PANIC, HEAT FANS? No, no it's not. I'm still convinced it was just the Heat trolling Twitter and/or starting a league-wide conspiracy to prevent the Sixers from landing Andrew Wiggins. Rookie guard Michael Carter-Williams came close to a triple-double in his professional debut for Philadelphia, prompting the ever-reliable and hilarious Twitter overreaction committee to have a field day. The New Orleans Pelicans premiered their new mascot last night, and the reviews ranged from screams of terror to shrieks of terror. There's no nice way to say it, this bird looks like something straight out my worst nightmare. While some were hoping the "Scream"-looking Pierre the Pelican was simply a Halloween version, this petrifying bird is apparently here to stay. Here's to hoping he doesn't frighten too many little children in the New Orleans area. The San Diego State baseball team held its annual Halloween game in which all the players rocked their costumes during an intrasquad scrimmage. If you ever wondered what it would be like if the Jamaican bobsled team were to hit a baseball, this is DEFINITELY the video for you. In honor of Halloween today, I've been posting some of my favorite athlete costumes all week. Today's honoree is New England Patriots QB Tom Brady and his supermodel wife, Gisele Bundchen, as the Cowardly Lion and Dorothy from "The Wizard of Oz." Make your own "cowardly" joke at Brady's expense here. But know that his life is 3487348745 times better than yours. See something worthy of inclusion on social media? Send it my way on Twitter, @darcymaine_espn!